You can see it in their eyes the first time they run into your arms after class. The new found look of glorious, sparkling confidence. Confidence that will build a foundation to succeed in whatever they may try today, and for the rest of their lives. For over 25 years, The Little Gym® has provided that foundation in our non-competitive motor skill development programs, such as gymnastics, sports skills and karate, all taught in a fun, safe and nurturing environment. We encourage children to develop at their own pace, building the self-esteem they need for fulfilling and successful lives. For every stage of your child?s development—from four months to 12 years—The Little Gym of Upper Westside offers a diverse line-up of Core Season and Summer Session programs filled with movement, music, learning and laughter. From week to week and from year to year, our age-appropriate curriculum is designed to facilitate ongoing skill development and maximum fun. New York children progress at their own pace, developing their confidence as they develop their skills. Explore the program offerings to find the one that?s just right for your child. Then, please join us for a free introductory class to see how The Little Gym of Upper Westside can inject some Serious Fun into your child?s life and into your own. From infant to toddler, The Little Gym of Upper Westside's Parent and Child classes promote early development and provide a strong foundation for your child?s critical first three years. Weekly New York classes will help your child achieve new milestones and prepare for more advanced challenges during each stage of growth. And since you?re along for the ride, you?ll be right there to celebrate every discovery with smiles, hugs and the occasional adult-sized giggle. Practically overnight, your little one changes from an unsteady toddler into a rambunctious child. At The Little Gym of Upper Westside, our gymnastics program for preschoolers and kindergarteners has been specially designed to help your child channel all that energy and reach developmental milestones. Independent enough to attend classes without parents, children in this age group still learn best in a structured environment where gymnastics activities for kids are combined with a healthy dose of fun. Kids of this age are still growing like crazy, but now each is developing at a unique pace. That?s why The Little Gym of Upper Westside's gymnastics program for grade school boys and girls is a little different than that of our younger members. Classes have been segmented to allow for gender-specific disciplines and varying developmental abilities, giving New York students the chance to tackle new challenges at their own skill level. Celebrated with cheers and high-fives, each new achievement leads to newfound confidence, determination and a desire to continue improving. Whether your child grows up to become an active team player, a weekend athlete or an enthusiastic fan, The Little Gym of Upper Westside Sports Skills Development classes pave the way for a lifetime of positive sports experiences by offering a solid grounding in the expertise, rules and strategies of team sports. Throughout the Core Season and Summer Session, our trained coaches run drills and simulated games for many popular sports including soccer, baseball, basketball, football, hockey and golf. Through fun and creative lesson plans, your child will also gain an understanding of teamwork and sportsmanship. And that?s a home run in any parent?s playbook. For living room leapers, bedroom ballerinas, and front yard frolickers, The Little Gym offers the perfect program to harness all that toe-tapping energy. The Little Gym of Upper Westside Dance program introduces children to ballet, tap, and hip-hop techniques, while allowing them to express themselves through creative movement. New York children spend a good part of class time refining their techniques in the studio space. Adding a unique twist to the program, dancers also spend part of each class working on complementary gymnastics skills in the gym in order to emphasize poise and balance. The best part? Each new burst of confidence will have you on your toes, too--with a proud standing ovation. The most important self-defense technique is self-confidence—and that?s exactly what your child will gain through The Little Gym of Upper Westside Karate Classes for kids. New York students learn fundamental karate blocks, punches and kicks in a positive, noncompetitive environment, with the addition of gymnastics techniques for a fun twist on the ancient martial art. Obstacle courses, high-energy music, skill-based activities and games create fun learning opportunities to help kids gain the focus needed to excel in the gym, in the classroom and everywhere else they go in life. Fantabulous. Splendiforous. There just aren?t enough synonyms to describe how awesome an Awesome Birthday Bash truly is. So, let?s see if this sums it up: Parents magazine named The Little Gym the #1 place to host children?s birthday parties. Your group will have the whole place to yourselves with games, music and fun activities created especially for your birthday kid. Our trained instructors will lead all the fun and The Little Gym of Upper Westside team will handle everything from setup to cleanup, which means you get to go home to a clean, quiet house when all the fun is done. It?s no surprise that many parents tell us an Awesome Birthday Bash is a big wish come true for them, too. Forget the bug spray and the week-long commitment. 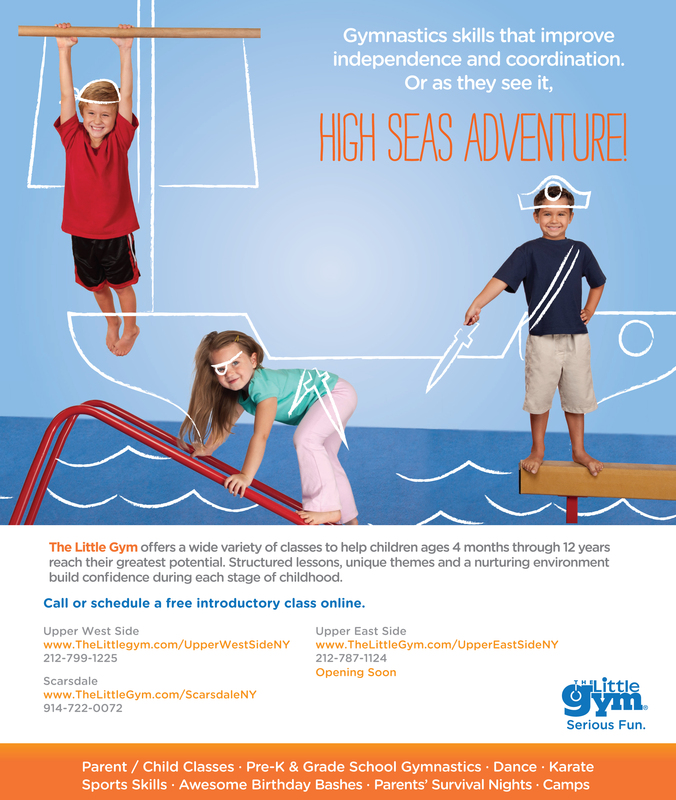 Day camp for kids at The Little Gym of Upper Westside is as great as you?d imagine. Held during vacation times when school?s not in session, our New York seasonal camps provide kids with giggle-filled relief from the winter doldrums or summer heat. The Little Gym camps combine physical activity and games with arts, crafts and special events. Each week offers an interactive learning theme and each day brings a different, creative lesson plan. Plus, flexible scheduling options allow you to sign up for several weeks, a single week or even just a day at a time. Sound like fun? Of course it is! This is The Little Gym, after all. Parents call it a break from the kids. Kids call it a break from their parents. That sounds like a win-win situation to us. The Little Gym of Upper Westside Parents? Survival Nights let you enjoy some adult time to see a movie, catch up with friends or enjoy a meal without—ahem—your pint-sized food critics in tow. Meanwhile, your children get some quality “kid time” in a safe, fun, familiar place with trained instructors who lead them through games and music-filled activities. We schedule Parents? Survival Nights for select Friday and Saturday evenings. Spots fill quickly, so call (914) 722-0072 to book your win-win parents’ night out. Since 1977, The Little Gym has been promoting healthy and successful physical and mental development of children. Its “Anytime Summertime Kids Fun” includes parent and child classes (ages 4 months to 3 years), preschool and kindergarten classes (ages 3-6), and grade school gymnastics (non-competitive!) for beginner, intermediate, or advanced gymnasts. It was a love of fitness and children that led Jeff Freeman and Ian Axelrod to open several The Little Gym locations throughout New York and New Jersey. Jeff’s love of sports shows through his own athleticism as well as his career choices. For nearly two decades, he and The Little Gym have been helping children develop socially and physically while having fun, teaching them that the key to a healthy lifestyle is an active lifestyle.